Torque curve is the main tool for the assembly analysis and study. This curve is obtained while fully threading the screw until assembly failure and torque values for each angle or time increment during all the process is registered. the parameters for a correct set up and optimization of the assembly line. the validation of the designs. the stability and ergonomics of the assembly. To obtain the maximum output of this test, it's very important to know and understand properly the information provided in the torque curve. The curve below depicted corresponds to tightening of REMFORM® screw diameter 6 on PBT+30GF plastic part. Threading torque Tth: s the minimum torque necessary to ensure some clamping force is loaded in the assembly. In the curve, this value corresponds to the maximum torque in this zone. 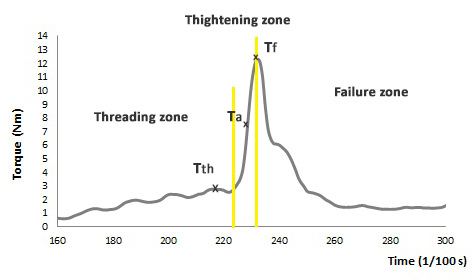 Threading energy is the area under the curve in the threading zone. The lower this area is, the more ergonomic the assembly will be (less effort for the screwdriver), but less resistance to vibration loosening resistance. Threading angle: corresponds to the turns necessary to fix the screw. Low angles provide with a high productivity in the lines. Tightening zone: it corresponds to torque and angle values just after clamp load is just started until the part fails. Optimal assembly torque Ta: assures the compression and prevents undesired deformation of the parts. Failure zone: it covers torque and angle values once clamp load is lost. Failure torque Tf: it is the torque value at which something in the assembly fails. It is the maximum torque allowed in the system and corresponds to the maximum value (peak) in these zones. Failure mode: defines how the assembly has failed. Typical failure modes are stripping off, screw breaking and recess damage. The stability of the assembly is determined by the difference between Threading torque and Failure torque.